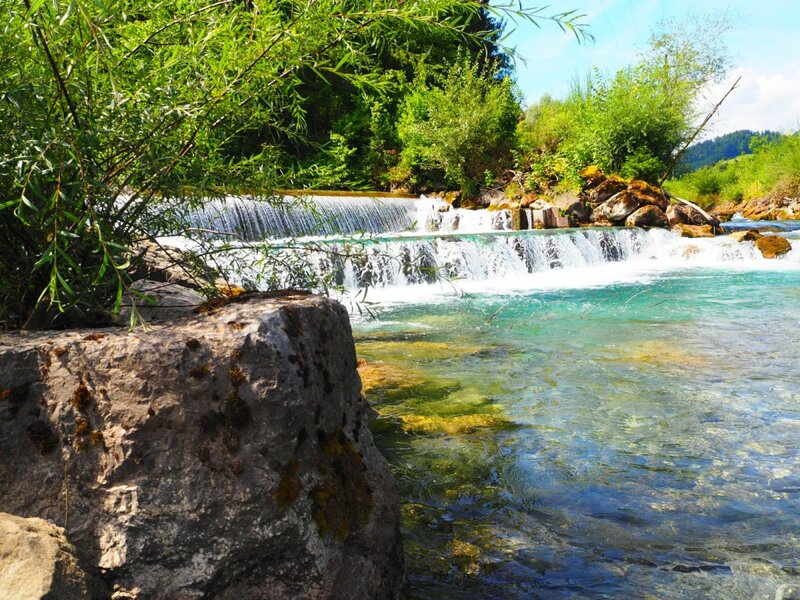 The source of the Iller is located in Oberstdorf, where it is formed through the confluence of the Trettach, Stillach and Breitach. As it starts to head north, the Iller winds its way through the Allgäu past the towns of Sonthofen, Immenstadt and Kempten. On the second half of its journey, the Iller flows through Upper Swabia, roughly marking the state border between Baden-Württemberg and Bavaria, before joining the Danube in Ulm and continuing to the Black Sea. The Breitach’s source is in the Kleinwalsertal Valley, while the sources of the two other tributary rivers, the Trettach and Stillach, are located in Bavaria. 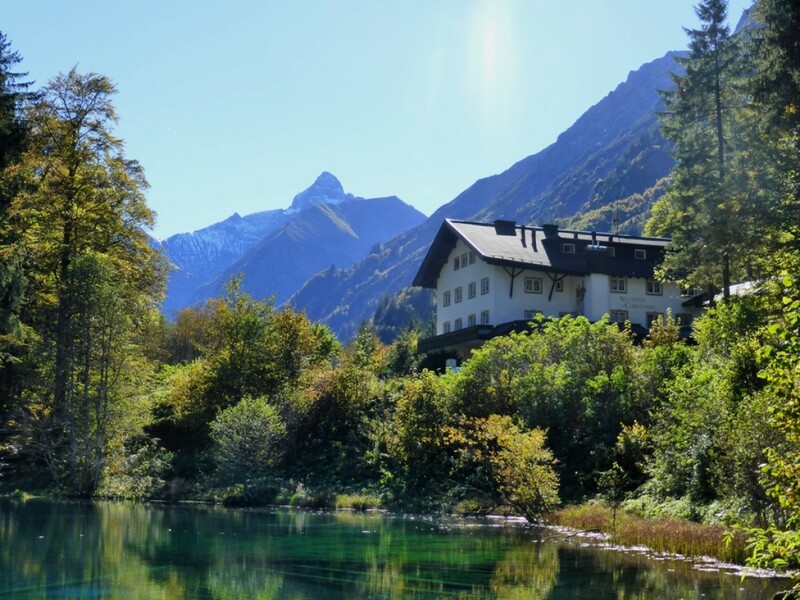 The Iller’s source is within easy walking distance of Oberstdorf, just by the “in form park” fitness centre to the north of the village. to the legend-steeped lake in the Trettachtal Valley. This unique natural monument, a natural rock arch is located at 1060 m altitude on Ochensberg at the northwestern border of Oberstdorf on Fischinger corridor. The impressive rock arch has a width of about 15 meters, a height of about 5 meters and a thickness of 1 to 2 meters. The view through the gate today offers an excellent view of Oberstdorf and its mountains. In June 2007, the Environment Committee of the district reported the rock formation as a natural monument and 2008! 1613. It’s also worth taking a brief detour to the Chapel of Saint Catherine, which can be reached by following the road from Birgsau. 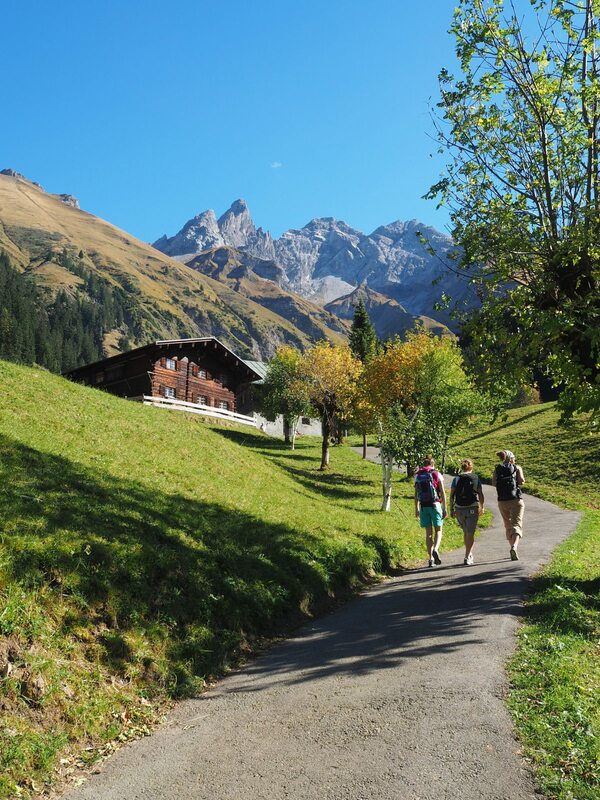 To the east, a hiking trail runs through the Bacherloch Gorge up to the Waltenberger Haus. To the south, the route leads into the Rappenalptal Valley. of between 400 and 500 years old, a traditional “Sennküche” restaurant, the old saw mill and a chapel. Until the end of the 19th century, the historic mountain settlement was still home to several farming families. 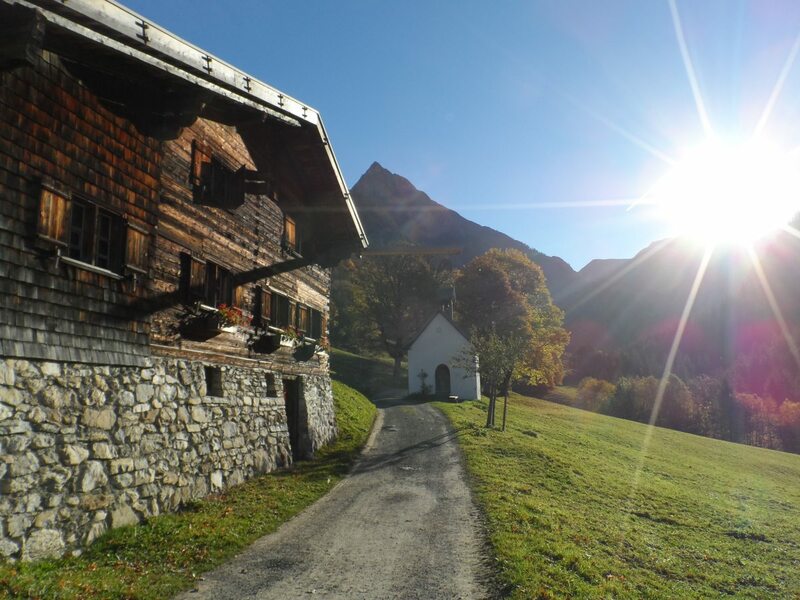 With its sun-browned timber buildings and surrounding mountain landscape, it today provides a truly unique setting. The buildings have been lovingly restored and preserved for posterity in an exemplary manner. The Jakobe-Haus, a farm house preserved almost completely in its original form, is open to visitors. The picturesque little rooms and chambers are truly enchanting. From the early summer, the flower mountain Fellhorn is a blossom sea of red Alps roses in Oberstdorf. The Alp roses prefer the boggy chalk poor grounds of the Alps. This is the area of Fellhorn which should be especially emphasized. The prime time to visit is from June to August. 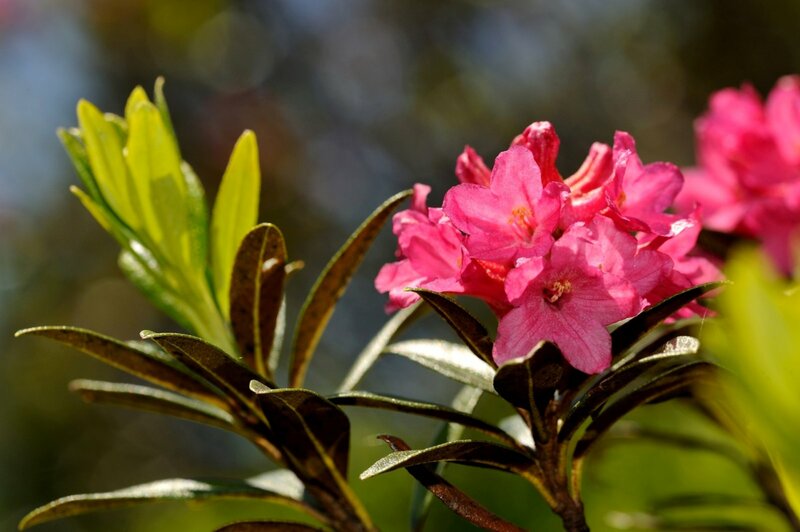 The Alp roses are a bush with evergreens, bare leaves and purple red, bell-shaped blossoms. These plants are known to grow up to 1 m high. On the flower mountain - Fellhorn numerous footpaths lead through the beautiful Alp rose fields.